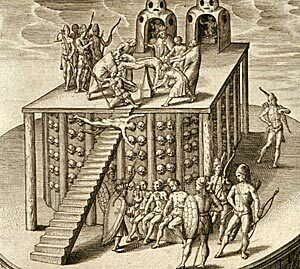 The ritual of human sacrifice remains the Aztecs' most extreme divergence from western ideas of civilization. In Cortés' time it justified views of Indian barbarism. "The usual method of sacrifice was to open the victim's chest, pull out his heart while he was still alive, and then knock the man down, rolling him down the temple steps, which were awash with blood. To understand this better, you must know that, at the place of sacrifice, six sacrificers came and were installed in this high rank: four to hold the victim's feet and hands, another for the throat, and one to cut the chest and extract the victim's heart.... Once these sacrificers were placed in order, they brought out all those who had been taken prisoner in the wars who were to be sacrificed at these festivals; accompanied closely by guards, they were made to climb those long staircases, all in rows, and totally naked, up to the place where one could see the ministers. As they arrived in order, they were each taken by the six sacrificers, one by the foot, another by the other foot, one by the hand and another by the other, and were thrown on their back against this pointed stone, where the fifth minister threw the necklace round their throat, and the sovereign priest opened their chest with his knife, with a strange quickness, pulling out their heart with his hands and showing it, still steaming, to the sun, and offering it this heat and steam. Then he turned to the idol, and threw it in his face; then they threw the victim's body down the temple steps... ."